With education institutes mushrooming in the country, it is advisable to calculate your return on investment before enrolling into one. Can you handle your education loan? Sonali Kapoor has completed her course in fashion design and is looking for a job. While the wait tests her patience, her problems are compounded by the fact that she has taken an education loan of Rs 4 lakh. "The loan repayment starts in a few months and If I don't find a job in time I may have to go home and ask my parents to repay the loan," says the 22-year-old. Kapoor is part of a growing number of students who have been struggling to repay their education loans . A number of factors have contributed to this situation, starting with the 2008 recession when many people lost their jobs in the aftermath of the global financial crisis. Also, over the past few years, a number of sub-standard educational institutions have mushroomed in various parts of the country, creating an oversupply of employable students. A number of such students manage to get jobs after finishing their degrees but low salaries mean quite a few end up defaulting on their loans. The numbers testify to the current situation. The credit quality of banks has deteriorated notably over the last three years. A loan is classified as a non-performing asset, or NPA, if the EMI is overdue for 90 days. Gross NPAs of banks rose from 2.4% of gross advances in March 2011 to 4.1% in March 2014. Net NPAs to net advances stood at 2.2% in March 2014. Banking experts say public sector banks have given education loans of around Rs 60,000 crore. The delinquency rate in the segment is as high as 8-9%. Shikha Sharma, managing director and CEO of Axis Bank, recently said in an interview that credit losses were very high in the education loan portfolio and that such loans were "becoming unviable". 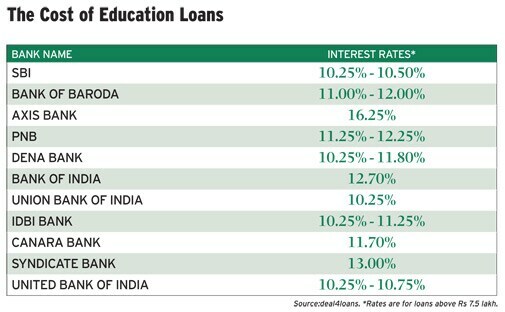 Neeraj Saxena, CEO, Avanse Education Loans, says, "Delinquency rates are highest in the low-ticket size education loans (Rs 1-4 lakh). These loans are mostly given without any guarantor or guarantee, so the borrower may not be under any pressure to repay on time." He adds that although loans may be available easily, the courses that students choose may not be up to the mark. So, a number of these students either end up unemployed or with jobs that do not pay them well enough to repay the loan. Another factor contributing to delinquency is the fact that borrowers are not educated enough about responsible borrowing and the repercussions of not repaying loans on time. Due to a rise in bad loans, banks are now shying away from lending to students. Rishi Mehra, co-founder, Deal-4loans.com, says, "Banks give priority to top 100 colleges in each stream. Students of colleges whose degrees are recognised and placement rates are high get loans easily. But smaller, private institutes which give diploma certifications are not preferred." Rahul Soota, executive director, mymoneymantra, a financial distribution company, says, "We have noticed that a large number of people have started taking personal loans for education as they are facing difficulty in getting loans from banks." Unlike personal loans, the repayment of education loan does not begin immediately. The education loan scheme provides a repayment holiday which is inclusive of the study period, plus a moratorium of one year or six months after getting the job, whichever is earlier. However, if you still default, your credit score gets affected, which is likely to create a problem when you apply for a loan in future. It is advisable to keep a buffer of at least three months before your EMIs begin. This way you will have some time in hand if you fail to get a job immediately or if there is any break in job. Here are a few options to consider if you are unable to pay off your debt. Extend the payment tenure: Education loans have longer tenures as one cannot start paying high EMIs fresh out of college. Punjab National Bank, whose exposure to the education loan segment stood at Rs 4,259 crore in June 2014, with NPAs of 4.43%, offers loans up to Rs 7.5 lakh, which can be repaid in ten years. For loans above Rs 7.5 lakh, repayment options of 15 years are available. If a student is not able to find a job in the moratorium period, he or she can apply for an extension of the tenure. By extending the tenure, one can reduce the EMI amount considerably. Adding to the point, LC Saravagi, assistant general manager, Punjab National Bank, says, "Those who had availed of education loans with a repayment period of up to five-seven years have the opportunity of getting the repayment period extended up to 10-15 years depending on a case-to-case basis." The key lies in discussing your financial situation with the bank. In a number of cases banks relax norms for repayment until a student finds a job. This, of course, becomes easier if you have a healthy, preexisting relationship with the bank. Saxena says, "In case the student is unable to repay on time, Avanse can extend the in-school period or the entire loan repayment term. In extenuating circumstances, Avanse lets the student defer repayment until he or she finds suitable employment. Avanse may even assist the student in his search for a job." Restructure the loan: You can get relaxations to make the repayment process easier. For example, many lenders allow students to pay just the simple interest or partial simple interest until he or she finds a suitable job. They also give a chance to pre-close the loan by liquidating an investment. Saxena says, "If the education loan is with a PSU bank, then Avanse can take over the loan at more favourable terms. The student may be allowed to swap the existing co-applicant for a more financially sound co-applicant who can repay the loan until the student is gets back on his feet." Anil Rego, a Banglore-based financial planner, says, "One should go back and see how a bank can restructure the loan. One can also ask the family for support for sometime till one gets a job. The interest rate on education loans is already low and so refinancing does not make sense." Get a part-time job: If you haven't found the right job and the moratorium of the loan is about to end, it may not be a bad idea to pick up a part-time job. This is, of course, not what you had in mind when you took the loan for a degree, but this way you can earn enough to pay EMIs in the initial days. Your credit score gets affected if you default on EMI. It spoils your credit score and you may not be eligible for a loan in future. It affects the guarantor as well. Saxena says, "The credit history of the guarantor is affected in the same way as the student's credit history as the guarantor has joint liability to repay the loan. This may jeopardise the guarantor's ability to access credit in future." However, since credit histories generally reflect the fact that the person concerned is a guarantor and not the primary applicant, financial institutions may take a softer approach towards the guarantor. What happens to the collateral? Saxena says, "If the guarantor has provided a tangible guarantee as collateral in the form of a property or fixed deposit for the education loan, he/she will not be able to have freehold rights on that collateral until the loan is repaid in full. The guarantor may not be able to get further loans on the collateral or utilize it in financial transactions." With education institutes mushrooming in the country it is advisable to calculate your return on investment before enrolling into one. Based on numbers, find out if the course is worth doing. Don't go by the promises and do enquire about the quality of education from the last batch.